Terri Perrin is an award-winning freelancer writer with more than 25 years industry experience and thousands of published articles to her credit. She is proud to be a long-standing member of the Professional Writers’ Association of Canada. Terri’s areas of special interest include responsible pet ownership, the human/companion animal bond, horses, travel and the grief process. She is also an avid gardener – struggling to learn the names of all of the spectacular plants on Vancouver Island – and a certified Feng Shui Consultant. Her first book, Building a Sustainable Future – Canadian Hydro Developers’ First Twenty Years, was published in March 2009. A recent transplant from Calgary, Terri, her husband Ron, their dog and two cats now call Courtenay home. As far as organizations go, Comox Valley Youth Music Centre (CYMC) is a survivor. British Columbia’s longest-running music camp has persevered despite the cancellation of government grant programs, dramatic fluctuations in student enrolment and, just last year, the suspension of its classical program, for years the heart and soul of the organization. Just as members of the Comox Valley arts community were beginning to whisper epitaphs to the storied non-profit organization, however, CYMC has once again rebounded for 2009 with new leadership, a revitalized classical program and an extensive line-up of performances that is poised to become one of the highlights of this summer’s local entertainment. Entering its 43rd season, CYMC is essentially a triumvirate of summer music camps, offering instruction in jazz, classical and musical theatre. Students, generally between the ages of 14 and 25, come to the Comox Valley from throughout the province, across the country and, until recently, around the globe to study alongside CYMC’s faculty of professional musicians. Students are also given the opportunity to perform at CYMC’s annual Festival of Summer Sounds, a series of public performances held at various venues throughout the Comox Valley. With the 2009 season quickly approaching, most of the buzz so far has centred on the revival of CYMC’s classical program. The recently resuscitated program will be directed by CYMC alumnus Dr. John van Deursen, associate conductor of the UBC Symphony Orchestra and director of Orchestra Armonia, a Vancouver-based string ensemble. Van Deursen, whose impressive resume also includes a 10-year stint as principal guest conductor for the Taipei Philharmonic Orchestra, adds an element of celebrity to the CYMC faculty, or at least as close to celebrity as you can get within Canadian classical music circles. Expanding on the “star power” theme, CYMC staff announced last month that legendary Dutch maestro Arthur Arnold will also join the classical program this year as guest conductor. Arnold debuted with the Moscow Symphony Orchestra in 2001 and co-founded the Symphony Orchestra Academy of the Pacific, in Powell River, in 2003. Between stints on the West Coast, he conducts orchestras throughout Europe, Asia and North America. If CYMC has a reputation for attracting world class faculty, which it does, it is equally renowned for the talented and well-known musicians that count themselves among the organization’s extensive alumni. Musicians who have used a CYMC summer camp as a stepping stone toward a professional music career include legendary drummer/composer Dave Robbins and contemporary jazz icon Diana Krall. According to CYMC’s website, former CYMC students can also be found in every symphony orchestra across Canada, as well as in major international orchestras such as the Boston, London and Berlin Philharmonics. “We’re very proud of the work we do and the programs we run,” says Wells. “One of the roles that CYMC plays is providing a summer camp where students can come and really hone their craft in terms of jazz, classical music and musical theatre, but in a venue where they’re immersed in the music and working with a lot of very talented people who are in the industry themselves. 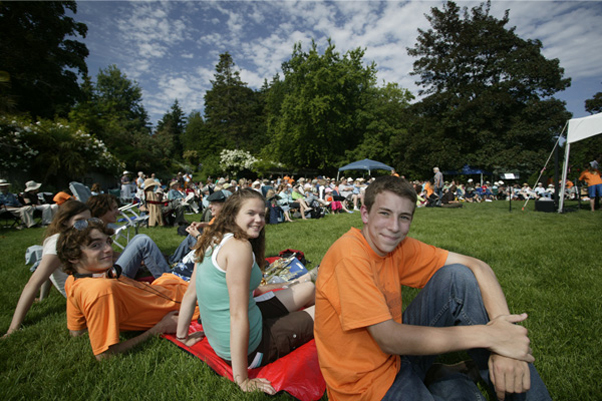 Rounding out CYMC’s 2009 season will be its musical theatre program and Pacific Jazz Workshop. The Pacific Jazz Workshop, led by returning director and award-winning music educator Dave Proznick, will feature at least six performances throughout July, including the ever-popular Jazz on the Promenade, an outdoor concert at the Comox Marina. On the musical theatre front, this year’s batch of young actors will give six performances of the edgy, Tony Award-winning Broadway musical RENT at Courtenay’s Sid Williams Theatre July 15 through 19. In addition to a full slate of music camps and performances, CYMC organizers have several other reasons to be excited about the upcoming season. The Comox Valley School District has offered them the use of Mark Isfeld School, giving CYMC’s jazz and classical programs a venue for instruction, performances and even student housing (musical theatre students will be housed at Cumberland’s Riding Fool Hostel). WestJet has also thrown its weight behind the organization, donating two tickets anywhere they fly for CYMC’s annual fundraising raffle, and, perhaps buoyed by the general sense of optimism, interest has been renewed in CYMC’s long-time goal of establishing a permanent conservatory of music in the Comox Valley.